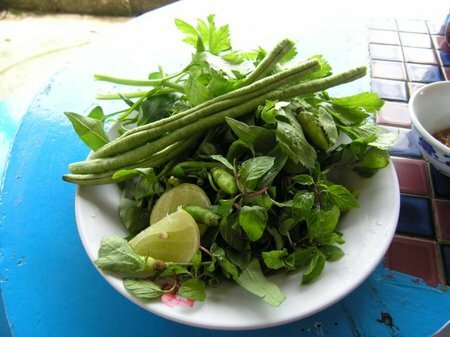 I spent a week in Luang Prabang and so I managed to have quite a few lunches there. It's a lovely little town and a UNESCO World Heritage Site as well. Here is what happens sometimes when you're an adventerous eater. You get weird stuff. I picked the "creaky pork" and "fried seaweed" from the menu. 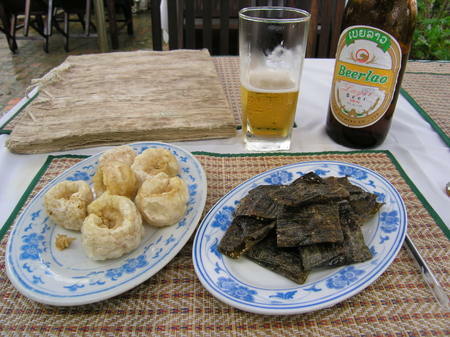 They were pretty tasty as beer snacks but not quite what I would call a real lunch. This on the other hand was very delicious. 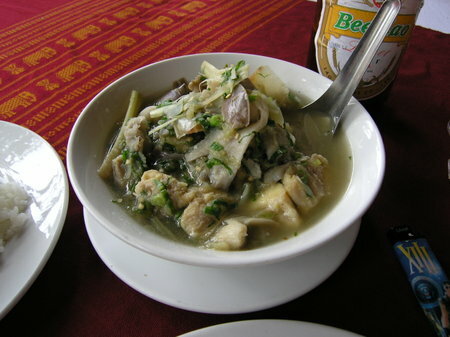 It's Luang Prabang fish stew, a traditional dish. 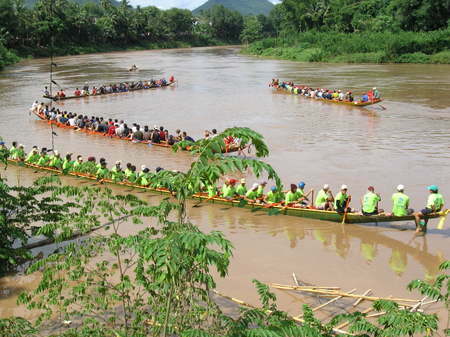 The annual boat races were on when I was there and I was lucky enough to find a restaurant right on the Nam Khan where I could watch. The stir fry chicken was kind of bland but the beer was cold and of course the view was just excellent. 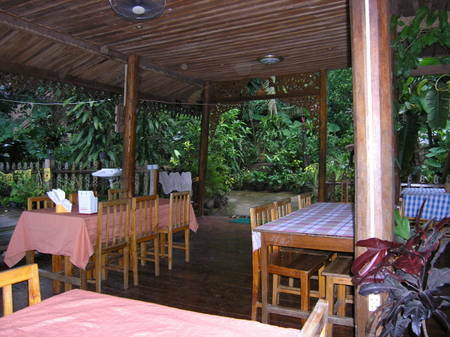 Inside the restaurant surrounded by beautiful green vegetation on one side and the river on the other, it was so peaceful. 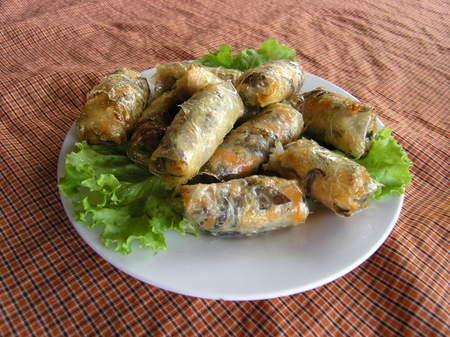 I had these delicious egg rolls while watching the races. 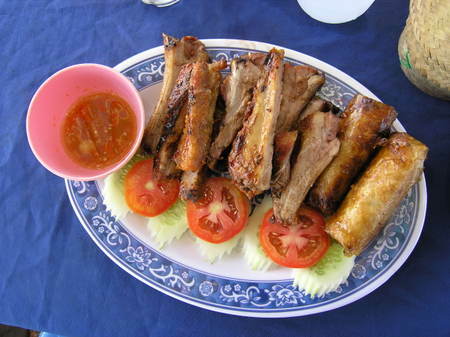 I've never had egg rolls like these before, the skin was very thin and crunchy. 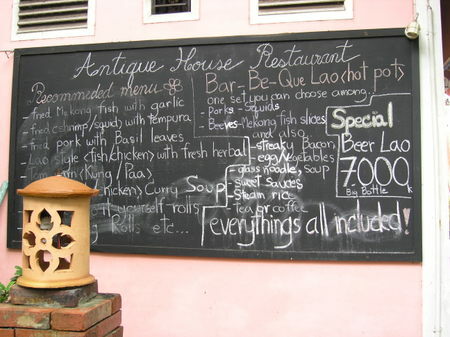 Here is a sign showing the cheapest beer prices I found in Luang Prabang - 70 cents for a big bottle. 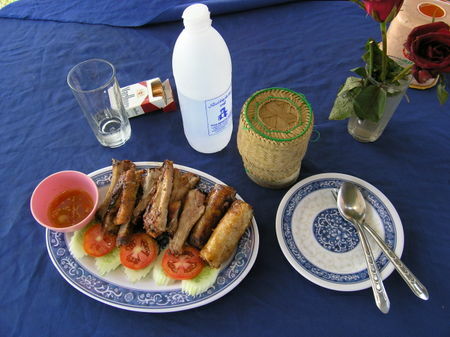 The airfare to Laos may be expensive but you more than make up for it on hotel and restaurant expenses. My room at the Sok Dee Guesthouse in a very nice part of Luang Prabang was only 8 USD/night. I had a TV with HBO, hot shower (actually luke warm...) and a comfortable bed and it was clean too. 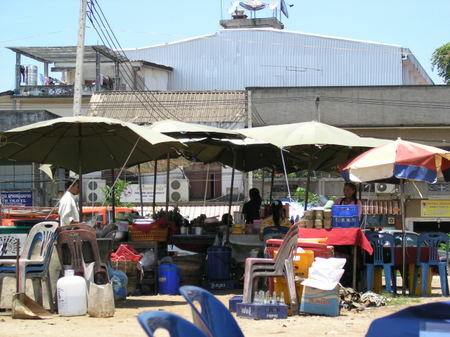 Add to that the fact that meals run around 3 to 4 dollars at most places and you can live quite nicely on 20 USD/day. You can also spend much less if you're willing to sacrifice some comfort. My whole 3 weeks in Laos cost less than the 6 days I spent in NYC last year. So, that's it for Laos. 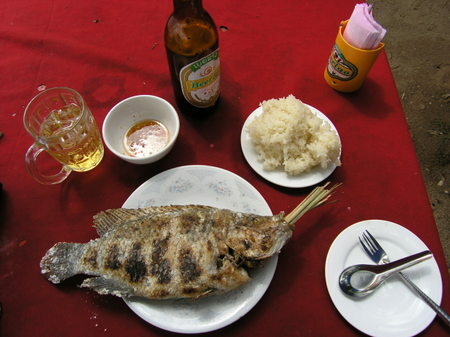 On Monday I'll post some Bangkok lunches and I've also got photos of all my airplane meals so perhaps I'll put those on too. They gave me a glass with ice in it. 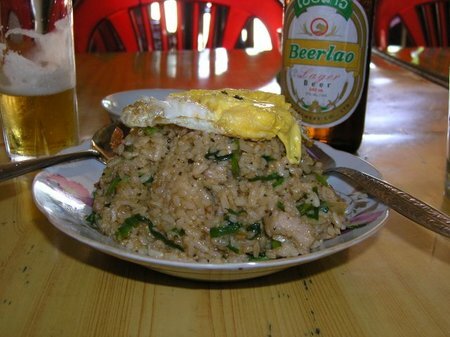 I guess this a traditional Lao way to drink beer? 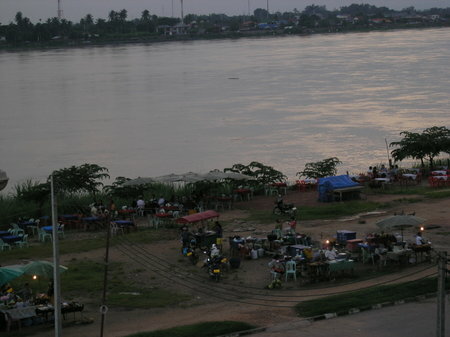 There are food stalls set up all along the Mekong in Vientiane. This photo was taken in the evening and on the other side of the river is Thailand. It's a pretty simple set up but the food is excellent. Everything is really fresh and you get a nice mix of both tourists and locals. 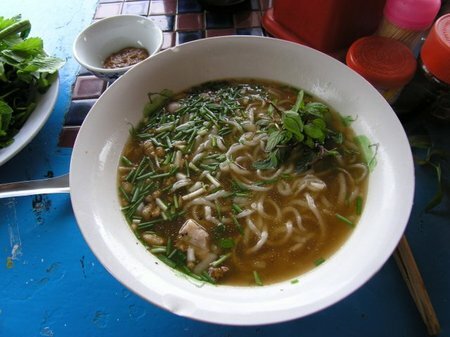 On my third and final day in Sam Neua, I had some delicious laap (not sure this is the correct spelling). 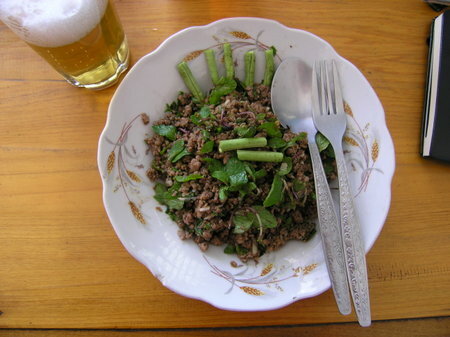 It's a traditional Lao dish made of minced meat or fish mixed with spices. 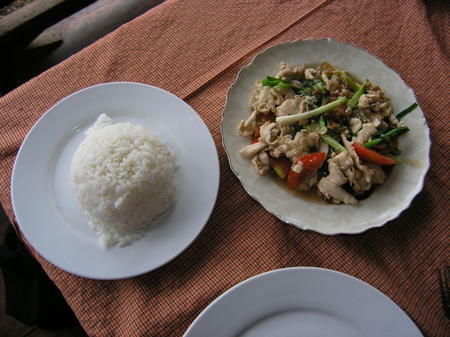 In my case it was beef and of course you should accompany this with a Beer Lao (the national beer and very good too). 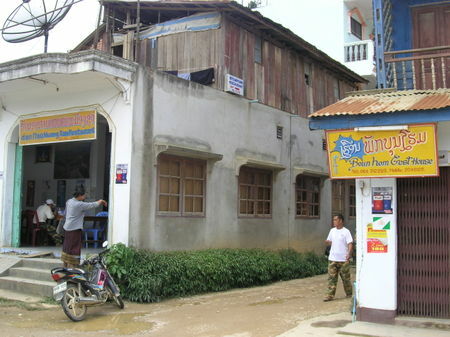 And here is a photo of the Dan Nao Muang Xam restaurant (they have an English menu), right next to the Boun Hom guesthouse where I had a lovely room for only 5 USD/night. 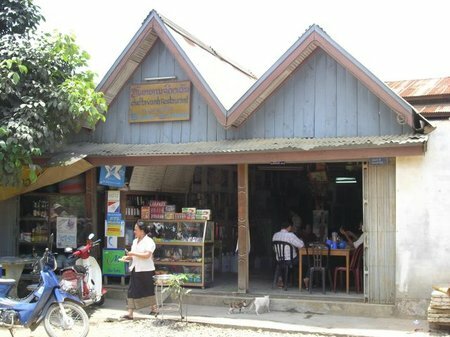 This whole place had such a laid back feel as did all of Laos for that matter. 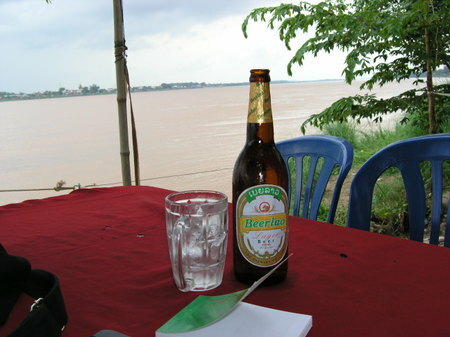 I also lunched in Vientiane and Luang Prabang so I'll be posting those soon. I just had such a marvellous time in Laos. If you are interested you can read my day by day postings here on my page on travelblog (I'm Emilyk; on this site). Travelblog is an excellent resource for anyone who wishes to post from far away...check it out for your next vacation. 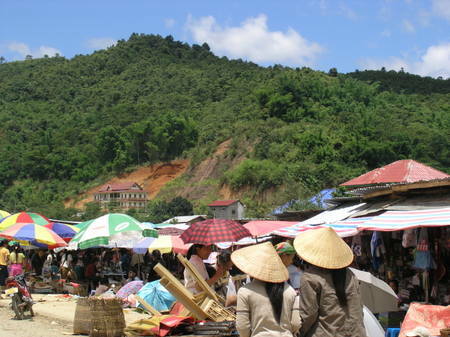 I also have some pages here on virtualtourist.com where I rate various places that I've travelled to (and I'm aemilys on this site). Anyway, I guess I should provide some background, I'm American from MA, I live in Paris and at 44 this was my first ever trip to Asia. I visited Thailand (mostly Bangkok) and Laos. My big adventure for 2006. 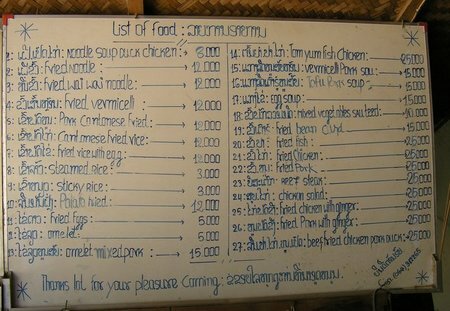 So today's lunch, well I had such a lovely and marvellous time in Sam Neua that I think I will present another lunch from there. I must say, if you want excellent pho with very tasty bits of pork and lots of fabulous greens you just must go to Sam Neua. 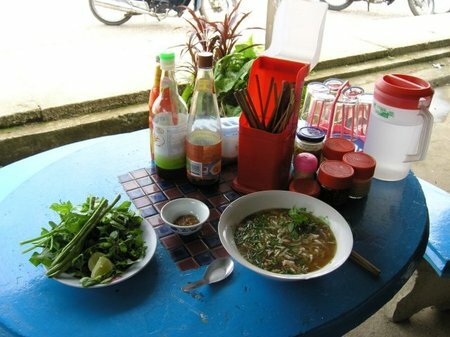 This was a little roadside restaurant, no one spoke English so when I arrived and saw some girls eating soup I just pointed to it and then pointed back to me and...wow, it was so good. And yes indeed I am back among you fellow lunchers once again...many fabulous lunches may have passed since my last post but as those of you who travel so well know...sometimes you just need a rest and so that is what I had. Anyway, while I was resting I ate a lot of lunches, and I took photos, and I took notes so all is not lost, as a matter of fact all is found. 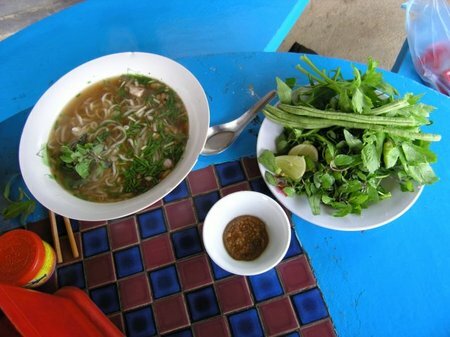 This first far away lunch is from Sam Neua in Laos, way out in the country. I now consider this place to be my "spiritual home" wow how corny but the lunch was just excellent as you will see.